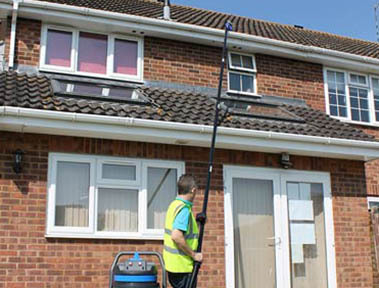 Gutter clearing is one of the top 5 most overlooked household maintenance tasks, the build up of debris within your rainwater system, left unattended can be a major cause of both internal and external damp problems, leading to repair works running into their £1000’s. For most properties annual clearance is sufficient to keep problems at bay. Accidents involving ladders are a major source of A+E visits, our works are carried out from the ground – hence making the job safer. We have £5mn liability insurance cover should anything go wrong. Why risk doing it yourself when we can do it for you? I know from past experience the fear of getting the ladders out to do any household task, it is particularly acute when it comes to clearing gutters the traditional way : Balanced on top of a ladder and over-stretching to clear debris just out of reach. For normal houses our prices range from £45-£95, we may charge a bit more for outbuildings and exceptionally large houses . 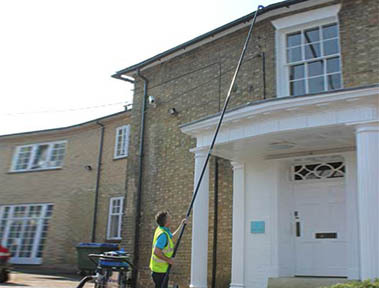 We offer a comprehensive gutter clearing solution for all types of commercial buildings up to 4 storeys high. We are fully insured and can provide a HSE risk assessment upon request. 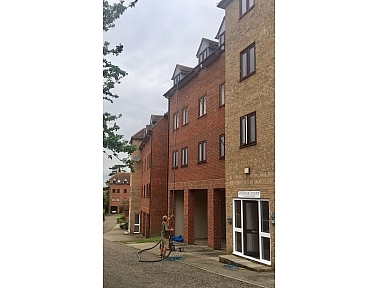 Our working hours are flexible and we fit in with clients needs to carry out the works. We know how easy it is for things to be out of sight, out of mind. Clearing the gutters isn't normally on top of the to-do list. Getting them cleared could end up saving you £1000's in the long run. Most landlords only act when it's too late. If you can see growth from ground level then this could already be damaging your assets. Just because you can't see it doesn't mean it's not there! Our onboard camera can show you what is lurking in the gutters. For landlords or agents with multiple properties we can offer a discounted service. 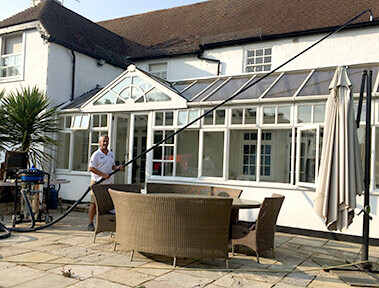 Anyone that owns a house with a conservatory knows that accessing around and above it is especially tricky. Getting a ladder above a conservatory is down-right dangerous for anyone foolish enough to try.